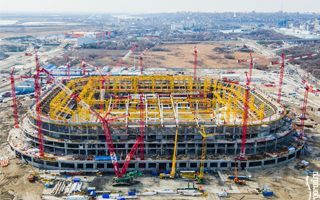 As the Rostov region construction minister informed this week, Rostov Arena is progressing very well and isn’t delayed. Though the project was launched as one of the last 2018 World Cup stadiums (late 2014 / early 2015), you can clearly see the outline of future stands, while the roof is also growing already. According to minister Nikolai Bezuglov, the overall outer structure is 69% ready, while staircases exceed 71%. Masonry is the most advanced part at 90%, while future ticket office is the least advanced (17%). With works going forward so fast, delivery deadline of December 25, 2017, should be met without issues. As you may remember, previously Rostov-on-Don was to have one of Russia’s most impressive stadiums, but it proved far too expensive to deliver in the shrinking budget (as ruble’s value dwindled) and too complicated as groundbreaking took place very late. Thus, a new concept was drawn, simplified as much as possible and using as few imported materials as necessary. Even with these measures its cost remains among the highest throughout the World Cup stadia, at over RUB 20 billion ($300m+).